Just a few days ago, I saw a three-year-old wandering around at 10:30 at night and wondered if he was lost or jet-lagged. The parent came over and explained that they believed in children setting their own sleep schedule. The problem with this approach is that it may work, or it may not. It may work for your oldest, but not your youngest. And therein lies the problem with the majority of the parenting advice available. It’s all tactics, no principles. Few topics provoke more unsolicited advice than parenting. The problem is, no matter how good the advice, it might not work for your child. Parenting is the ultimate “the map is not the territory“ situation. There are so many maps out there, and often when we try to use them to navigate the territory that is each individual child, we end up lost and confused. As in other situations, when the map doesn’t match the territory, better to get rid of the map and pay attention to what you are experiencing on the ground. The territory is the reality. We’ve all dealt with the seemingly illogical behavior of children. Take trying to get your child to sleep through the night—often the first, and most important, challenge. Do you sleep beside them and slowly work your way out of the room? Do you let them “cry it out?” Do you put them in your bed? Do you feed them on demand, or not until morning? Soft music or no music? The options are endless, and each of them has a decently researched book to back it up. When any subsequent children come along, the problem is often exacerbated. You stick to what worked the first time, because it worked, but this little one is different. Now you’re in a battle of wills, and it’s hard to change your tactics at 3:00 a.m. Parenting is often a rinse and repeat of this scenario: ideas you have about how it should be, combined with what experience is telling you that it is, overlaid with too many options and chronic exhaustion. In terms of parenting, this is a big one: the model we can use to stop criticizing ourselves for our inevitable parenting mistakes, to get out of the no-point comparisons with our peers, and to give us the freedom to make changes depending on the situation we find ourselves in. Species adapt. It is a central feature of the theory of evolution—the ability of a species to survive and thrive in the face of changing environmental conditions. So why not apply this basic biological idea to parenting? Too often we see changing as a weakness. We’re certain that if we aren’t absolutely consistent with our children, they will grow up to be entitled underachievers or something. Or we put pressure on ourselves to be perfect, and strive for an ideal that requires an insane amount of work and sacrifice that may actually be detrimental to our overall success. We can get out of this type of thinking if we reframe ‘changing’ as ‘adapting’. It’s okay to have different rules in the home versus a public space. I am always super grateful when a parent pacifies a screaming child with a cookie, especially on an airplane or in a restaurant. They probably don’t use the same strategy at home, but they adapt to the different environment. It’s also okay to have two children in soccer, and the third in music. Adapting to their interests will offer a much better return of investment on all those lessons. No doubt your underlying goals for your children are consistent, like the desire of an individual to survive. How you meet those goals is where the adaptability comes in. Give yourself the freedom to respond to the individual characteristics of your children—and the specific needs of the moment—by trying different behaviors to see what works. And, just as with adaptation in the biological sense, you only need to be as good as you have to be to get the outcomes that are important to you, not be the best parent that ever was. There is a difference between speed and velocity. With speed you move, but with velocity you move somewhere. You have direction. As many have said of parenting, the days are long but the years are short. It’s hard to be focusing on your direction when homework needs to be done and dinner needs to get made before one child goes off in the carpool to soccer while you rush the other one to art class. Every day begins at a dead run and ends with you collapsing into bed only to go through it all again tomorrow. Between their activities and social lives, and your need to work and have time for yourself, there is no doubt that you move with considerable speed throughout your day. But it’s useful to sometimes ask, ‘Where am I going?’ Take a moment to make sure it’s not all speed and no direction. When it comes to time with your kids, what does the goal state look like? How do you move in that direction? If you are just speeding without moving then you have no frame of reference for your choices. You might ask, did I spend enough time with them today? But ten minutes or two hours isn’t going to impact your velocity if you don’t know where you are headed. When you factor in a goal of movement, it helps you decide what to do when you have time with them. What is it you want out of it? What kind of memories do you want them to have? What kind of parent do you want to be and what kind of children do you want to raise? The answers are different for everyone, but knowing the direction you wish to go helps you evaluate the decisions you make. And it might have the added benefit of cutting out some unnecessary activity and slowing you down. “He got more pancakes than I did!” Complaints about fairness are common among siblings. They watch each other like hawks, counting everything from presents to hugs to make sure everyone gets the same. What can you do? You can drive yourself mad running out to buy an extra whatever, or you can teach your children the difference between ‘same’ and ‘equal’. If you haven’t solved for x in a while, it doesn’t really matter. In algebra, symbols are used to represent unknown numbers that can be solved for given other relevant information. The general point about algebraic equivalence is that it teaches us that two things need not be the same in order to be equal. And those are just the simple ones. What is useful is this idea of abstracting to see what the full scope of possibilities are. Then you can demonstrate that what is on each side of those little parallel lines doesn’t have to look the same to have equal value. When it comes to the pancakes, it’s better to focus on an equal feeling of fullness then the number of pancakes on the plate. In a deeper way, algebraic equivalence helps us deal with one accusation that all parents get at one time or another: “You love my sibling more than me.” It’s not true, but our default usually is to say, “No, I love you both the same.” This can be confusing for children, because, after all, they are not the same as their sibling, and you likely interact with them differently, so how can the love be the same? Using algebraic equivalence as a model shifts it. You can respond instead that you love them both equally. Even though what’s on either side of the equation is different, it is equal. Swinging the younger child up in the air is equivalent to asking the older one about her school project. Appreciating one’s sense of humor is equivalent to respecting the other’s organizational abilities. They may be different, but the love is equal. In parenting, seizing the middle means you must forget trying to control every single move. It’s impossible anyway. Instead, focus on trying to control what I think of as the middle territory. I don’t mind losing a few battles on the fringes, if I’m holding my ground in the area that will allow me to respond quickly to problems. The other night my son and I got into perhaps our eighth fight of the week on the state of his room. The continual explosion makes it hard to walk in there, plus he loses things all the time, which is an endless source of frustration to both of us. I’ve explained that I hate buying replacements only to have them turn up in the morass months later. So I got cranky and got on his case again, and he felt bad and cried again. When I went to the kitchen to find some calm, I realized that my strategy was all wrong. I was focused on the pawn in the far column of the chess board instead of what the pieces were doing right in front of me. My thinking then went like this: what is the territory I want to be present in? Continuing the way I was would lead to a clean room, maybe. But by focusing on this flank I was sacrificing control of the middle. Eventually he was going to tune me out because no one wants to feel bad about their shortcomings every day. Is it worth saving a pawn if it leaves your queen vulnerable? The middle territory with our kids is mutual respect and trust. If I want my son to come to me for help when life gets really complicated, which I do, then I need to focus on behaviors that will allow me to have that strategic influence throughout my relationship with him. Making him feel like crap every day, because his shirts are mixed in with his pants or because of all the Pokemon cards are on the floor, isn’t going to cut it. Make no mistake, seizing the middle is not about throwing out all the rules. This is about knowing which battles to fight, so you can keep the middle territory of the trust and respect of your child. Sometimes it’s not about providing solutions, but removing obstacles. Sociologist Kurt Lewin observes in his work on force field analysis that reaching any goal has two components: augmenting the forces for, and removing the forces against. When it comes to parenting, we need to ask ourselves not only what we could be doing more of, but also what we could be doing less of. When my friend was going on month number nine of her baby waking up four times a night, she felt at her wits’ end. Out of desperation, she decided to invert the problem. She had been trying different techniques and strategies, thinking that there was something she wasn’t doing right. When nothing seemed to be working, she stopped trying to add elements like new tactics, and changed her strategy. She looked instead for obstacles to remove. Was there anything preventing the baby from sleeping through the night? The first night she made it darker. No effect. The second night she made it warmer. Her son has slept through the night ever since. It wasn’t her parenting skills or the adherence to a particular sleep philosophy that was causing him to wake up so often. Her baby was cold. Once she removed that obstacle with a space heater the problem was resolved. We do this all the time, trying to fix problem by throwing new parenting philosophies at the situation. What can I do better? More time, more money, more lessons, more stuff. But it can be equally valuable to look for what you could be doing less of. In so doing, you may enrich your relationships with your children immeasurably. Parenting is inherently complex: the territory changes almost overnight. Different environments, different children—figuring out how to raise your kids plays out against a backdrop of some fast-paced evolution. Some tactics are great, and once in a while a technique fits the situation perfectly. But when your tactics fail, or your experience seems to provide no obvious direction, a principle-based mental models approach to parenting can give you the insight to find solutions as you go. Lewin’s original work on force field analysis can be found in Lewin, Kurt. Field Theory in Social Science. New York: Harper and Row, 1951. Fighter pilots have to work fast. Taking a second too long to make a decision can cost them their lives. As anyone who has ever watched Top Gun knows, pilots have a lot of decisions and processes to juggle when they’re in dogfights (close-range aerial battles). Pilots move at high speeds and need to avoid enemies while tracking them and keeping a contextual knowledge of objectives, terrains, fuel, and other key variables. Dogfights are nasty. I’ve talked to pilots who’ve been in them. They want the fights to be over as quickly as possible. The longer they go, the higher the chances that something goes wrong. Pilots need to rely on their creativity and decision-making abilities to survive. There is no game plan to follow, no schedule or to-do list. There is only the present moment when everything hangs in the balance. Boyd was no armchair strategist. He developed his ideas during his own time as a fighter pilot. He earned the nickname “Forty-Second Boyd” for his ability to win any fight in under 40 seconds. Reflecting Robert Greene’s maxim that everything is material, Boyd spent his career observing people and organizations. How do they adapt to changeable environments in conflicts, business, and other situations? Over time, he deduced that these situations are characterized by uncertainty. Dogmatic, rigid theories are unsuitable for chaotic situations. Rather than trying to rise through the military ranks, Boyd focused on using his position as colonel to compose a theory of the universal logic of war. Boyd was known to ask his mentees the poignant question, “Do you want to be someone, or do you want to do something?” In his own life, he certainly focused on the latter path and, as a result, left us ideas with tangible value. The OODA loop is just one of many. Let’s break down the four parts of the OODA loop and see how they fit together. OODA stands for Observe, Orient, Decide, Act. The description of it as a loop is crucial. Boyd intended the four steps to be repeated again and again until a conflict finishes. Although most depictions of the OODA loop portray it as a superficial idea, there is a lot of depth to it. Using it should be simple, but it has a rich basis in interdisciplinary knowledge. The first step in the OODA Loop is to observe. At this stage, the main focus is to build a comprehensive picture of the situation with as much accuracy as possible. A fighter pilot needs to consider: What is immediately affecting me? What is affecting my opponent? What could affect us later on? Can I make any predictions, and how accurate were my prior ones? A pilot’s environment changes rapidly, so these observations need to be broad and fluid. And information alone is not enough. The observation stage requires awareness of the overarching meaning of the information. It also necessitates separating the information which is relevant for a particular decision from that which is not. You have to add context to the variables. The observation stage is vital in decision-making processes. For example, faced with a patient in an emergency ward, a doctor needs to start by gathering as much foundational knowledge as possible. That might be the patient’s blood pressure, pulse, age, underlying health conditions, and reason for admission. At the same time, the doctor needs to discard irrelevant information and figure out which facts are relevant for this precise situation. Only by putting the pieces together can she make a fast decision about the best way to treat the patient. The more experienced a doctor is, the more factors she is able to take into account, including subtle ones, such as a patient’s speech patterns, his body language, and the absence (rather than presence) of certain signs. Orientation, the second stage of the OODA loop, is frequently misunderstood or skipped because it is less intuitive than the other stages. Boyd referred to it as the schwerpunkt, a German term which loosely translates to “the main emphasis.” In this context, to orient is to recognize the barriers that might interfere with the other parts of the process. Without an awareness of these barriers, the subsequent decision cannot be a fully rational one. Orienting is all about connecting with reality, not with a false version of events filtered through the lens of cognitive biases and shortcuts. Including this step, rather than jumping straight to making a decision, gives us an edge over the competition. Even if we are at a disadvantage to begin with, having fewer resources or less information, Boyd maintained that the Orient step ensures that we can outsmart an opponent. For Western nations, cyber-crime is a huge threat — mostly because for the first time ever, they can’t outsmart, outspend, or out-resource the competition. Boyd has some lessons for them. Boyd was one of the first people to discuss the importance of building a toolbox of mental models, prior to Charlie Munger’s popularization of the concept among investors. Boyd believed in “destructive deduction” — taking note of incorrect assumptions and biases and then replacing them with fundamental, versatile mental models. Only then can we begin to garner a reality-oriented picture of the situation, which will inform subsequent decisions. Boyd employed a brilliant metaphor for this — a snowmobile. In one talk, he described how a snowmobile comprises elements of different devices. The caterpillar treads of a tank, skis, the outboard motor of a boat, the handlebars of a bike — each of those elements is useless alone, but combining them creates a functional vehicle. To orient ourselves, we have to build a metaphorical snowmobile by combining practical concepts from different disciplines. No surprises here. Having gathered information and oriented ourselves, we have to make an informed decision. The previous two steps should have generated a plethora of ideas, so this is the point where we choose the most relevant option. Boyd cautioned against first-conclusion bias, explaining that we cannot keep making the same decision again and again. This part of the loop needs to be flexible and open to Bayesian updating. In some of his notes, Boyd described this step as the hypothesis stage. The implication is that we should test the decisions we make at this point in the loop, spotting their flaws and including any issues in future observation stages. While technically a decision-making process, the OODA loop is all about action. The ability to act upon rational decisions is a serious advantage. The other steps are mere precursors. A decision made, now is the time to act upon it. Also known as the test stage, this is when we experiment to see how good our decision was. Did we observe the right information? Did we use the best possible mental models? Did we get swayed by biases and other barriers? Can we disprove the prior hypothesis? Whatever the outcome, we then cycle back to the first part of the loop and begin observing again. The OODA loop has four key benefits. Fighter pilots must make many decisions in fast succession. They don’t have time to list pros and cons or to consider every available avenue. Once the OODA loop becomes part of their mental toolboxes, they should be able to cycle through it in a matter of seconds. Speed is a crucial element of military decision making. Using the OODA loop in everyday life, we probably have a little more time than a fighter pilot would. But Boyd emphasized the value of being decisive, taking initiative, and staying autonomous. These are universal assets and apply to many situations. Take the example of modern growth hacker marketing. The key advantage growth hackers have over traditional marketers is speed. They observe (look at analytics, survey customers, perform a/b tests, etc.) and orient themselves (consider vanity versus meaningful metrics, assess interpretations, and ground themselves in the reality of a market) before making a decision and then acting. The final step serves to test their ideas and they have the agility to switch tactics if the desired outcome is not achieved. Meanwhile, traditional marketers are often trapped in lengthy campaigns which do not offer much in the way of useful metrics. Growth hackers can adapt and change their techniques every single day depending on what works. They are not confined by stagnant ideas about what worked before. So, although they may have a small budget and fewer people to assist them, their speed gives them an advantage. Just as Boyd could defeat any opponent in under 40 seconds (even starting at a position of disadvantage), growth hackers can grow companies and sell products at extraordinary rates, starting from scratch. Uncertainty does not always equate to risk. A fighter pilot is in a precarious situation, where there will be gaps in their knowledge. They cannot read the mind of the opponent and might have incomplete information about the weather conditions and surrounding environment. They can, however, take into account key factors such as the opponent’s nationality, the type of airplane they are flying, and what their maneuvers reveal about their intentions and level of training. If the opponent uses an unexpected strategy, is equipped with a new type of weapon or airplane, or behaves in an irrational, ideologically motivated way, the pilot must accept the accompanying uncertainty. However, Boyd belabored the point that uncertainty is irrelevant if we have the right filters in place. If we don’t, we can end up stuck at the observation stage, unable to decide or act. But if we do have the right filters, we can factor uncertainty into the observation stage. We can leave a margin of error. We can recognize the elements which are within our control and those which are not. Three key principles supported Boyd’s ideas. In his presentations, he referred to Gödel’s Proof, Heisenberg’s Uncertainty Principle, and the Second Law of Thermodynamics. Gödel’s theorems indicate that any mental model we have of reality will omit certain information and that Bayesian updating must be used to bring it in line with reality. Our understanding of science illustrates this. In the past, people’s conception of reality missed crucial concepts such as criticality, relativity, the laws of thermodynamics, and gravity. As we have discovered these concepts, we have updated our view of the world. Yet we would be foolish to think that we now know everything and our worldview is complete. Other key principles remain undiscovered. The same goes for fighter pilots — their understanding of what is going on during a battle will always have gaps. Identifying this fundamental uncertainty gives it less power over us. The second concept Boyd referred to is Heisenberg’s Uncertainty Principle. In its simplest form, this principle describes the limit of the precision with which pairs of physical properties can be understood. We cannot know the position and the velocity of a body at the same time. We can know either its location or its speed, but not both. Although Heisenberg’s Uncertainty Principle was initially used to describe particles, Boyd’s ability to combine disciplines led him to apply it to planes. If a pilot focuses too hard on where an enemy plane is, they will lose track of where it is going and vice versa. Trying harder to track the two variables will actually lead to more inaccuracy! Heisenberg’s Uncertainty Principle applies to myriad areas where excessive observation proves detrimental. Reality is imprecise. Finally, Boyd made use of the Second Law of Thermodynamics. In a closed system, entropy always increases and everything moves towards chaos. Energy spreads out and becomes disorganized. Although Boyd’s notes do not specify the exact applications, his inference appears to be that a fighter pilot must be an open system or they will fail. They must draw “energy” (information) from outside themselves or the situation will become chaotic. They should also aim to cut their opponent off, forcing them to become a closed system. Drawing on his studies, Boyd developed his Energy Maneuverability theory, which recast maneuvers in terms of the energy they used. Using the OODA loop should enable us to act faster than an opponent, thereby seeming unpredictable. While they are still deciding what to do, we have already acted. This resets their own loop, moving them back to the observation stage. Keep doing this, and they are either rendered immobile or forced to act without making a considered decision. So, they start making mistakes, which can be exploited. Boyd recommended making unpredictable changes in speed and direction, and wrote, “we should operate at a faster tempo than our adversaries or inside our adversaries[’] time scales. … Such activity will make us appear ambiguous (non predictable) [and] thereby generate confusion and disorder among our adversaries.” He even helped design planes better equipped to make those unpredictable changes. For the same reason that you can’t run the same play 70 times in a football game, rigid military strategies often become useless after a few uses, or even one iteration, as opponents learn to recognize and counter them. The OODA loop can be endlessly used because it is a formless strategy, unconnected to any particular maneuvers. We know that Boyd was influenced by Sun Tzu (he owned seven thoroughly annotated copies of The Art of War), and he drew many ideas from the ancient strategist. Sun Tzu depicts war as a game of deception where the best strategy is that which an opponent cannot pre-empt. Apple has long used this strategy as a key part of their product launches. Meticulously planned, their launches are shrouded in secrecy and the goal is for no one outside the company to see a product prior to the release. When information has been leaked, the company has taken serious legal action as well as firing associated employees. We are never sure what Apple will put out next (just search for “Apple product launch 2017” and you will see endless speculation based on few facts). As a consequence, Apple can stay ahead of their rivals. Once a product launches, rival companies scramble to emulate it. But by the time their technology is ready for release, Apple is on to the next thing and has taken most of the market share. Although inexpensive compared to the drawn-out product launches other companies use, Apple’s unpredictability makes us pay attention. Stock prices rise the day after, tickets to launches sell out in seconds, and the media reports launches as if they were news events, not marketing events. A notable omission in Boyd’s work is any sort of specific instructions for how to act or which decisions to make. This is presumably due to his respect for testing. He believed that ideas should be tested and then, if necessary, discarded. Boyd’s OODA is a feedback loop, with the outcome of actions leading back to observations. Even in Aerial Attack Study, his comprehensive manual of maneuvers, Boyd did not describe any particular one as superior. He encouraged pilots to have the widest repertoire possible so they could select the best option in response to the maneuvers of an opponent. We can incorporate testing into our decision-making processes by keeping track of outcomes in decision journals. Boyd’s notes indicate that he may have done just that during his time as a fighter pilot, building up the knowledge that went on to form Aerial Attack Study. Rather than guessing how our decisions lead to certain outcomes, we can get a clear picture to aid us in future orientation stages. Over time, our decision journals will reveal what works and what doesn’t. In sports, there is an adage that carries over to business quite well: “Speed kills.” If you are able to be nimble, able to assess the ever-changing environment and adapt quickly, you’ll always carry the advantage over your opponent. Start applying the OODA loop to your day-to-day decisions and watch what happens. You’ll start to notice things that you would have been oblivious to before. Before jumping to your first conclusion, you’ll pause to consider your biases, take in additional information, and be more thoughtful of consequences. As with anything you practice, if you do it right, the more you do it, the better you’ll get. You’ll start making better decisions more quickly. You’ll see more rapid progress. And as John Boyd would prescribe, you’ll start to DO something in your life, and not just BE somebody. The book Simple Rules by Donald Sull and Kathleen Eisenhardt has a very interesting chapter on strategy, which tries to answer the following question: How do you translate your broad objectives into a strategy that can provide guidelines for your employees from day to day? It’s the last bit there which is particularly important — getting everyone on the same page. Companies don’t seem to have a problem creating broad objectives (which isn’t really a strategy). Your company might not call them that, they might call them “mission statements” or simply “corporate goals.” They sound all well and good, but very little thought is given to how we will actually implement these lofty goals. Developing a strategy and implementing it are often viewed as two distinct activities — first you come up with the perfect plan and then you worry about how to make it happen. This approach, common through it is, creates a disconnect between what a company is trying to accomplish and what employees do on a day-to-day basis. Figure out what will move the needles. 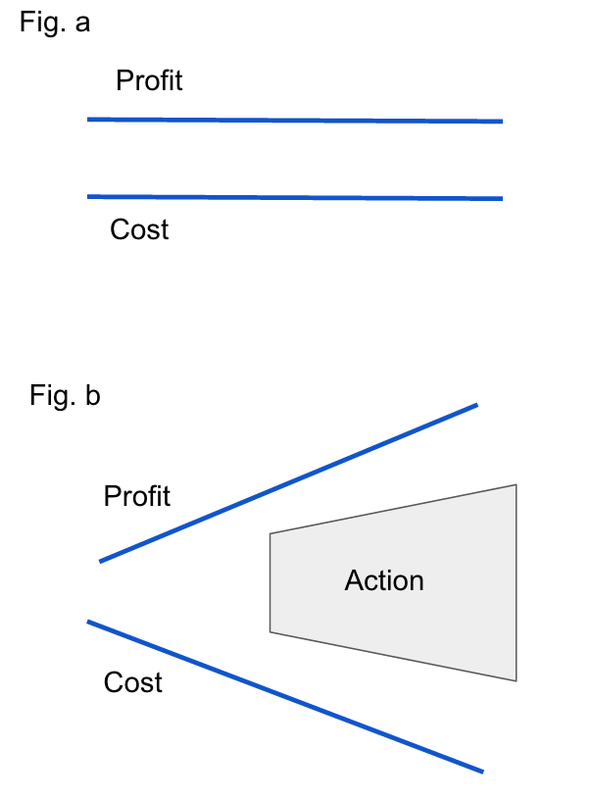 The authors use a dual needle metaphor to visualize corporate profits. They see it as two parallel needles: an upper needle which represents revenues and a lower needle which represents costs. 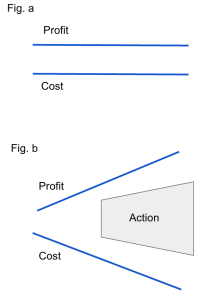 The first critical step is to identify which actions will drive a wedge between the needles causing an increase in profits, a decrease in costs, and sustain this over time. In other words, as simple as it sounds, we need an actual set of steps to get from figure a. to figure b. What action will become the wedge that will move the needles? Who will we target as customers? What product or service will we offer? How will we provide this product at a profit? When you are trying to massage out these answers remember to use inversion as well. Equally important are the choices on who not to serve and what not to offer. Steve Jobs once pointed out that Apple was defined as much by what it didn’t do as by what it did. Speaking of inversion, in order to complete our goal we must also figure out what’s holding us back from moving the needles — the bottlenecks standing in our way. When it comes to implementing a strategy of simple rules, pinpointing the precise decision or activity where rules will have the most impact is half the battle. We use the term bottleneck to describe a specific activity or decision that hinders a company from moving the needles. You may be surprised at the amount of bottlenecks you come across, so you’ll have to practice some “triage” of your issues, sorting what’s important from what’s really important. They have a direct and significant impact on value creation. They should represent recurrent decisions (as opposed to ‘one off’ choices). They should be obstacles that arise when opportunities exceed available resources. Once we’ve established what the bottlenecks are, it’s time to craft the rules which will provide you a framework in which to remove them. Developing rules from the top down is a big mistake. When leaders rely on their gut instincts, they overemphasize recent events, build in their personal biases, and ignore data that doesn’t fit with their preconceived notions. It is much better to involve a team, typically ranging in size from four to eight members, and use a structured process to harness members’ diverse insights and points of view. When drafting the dream team to develop simple rules, it is critical to include some of the people who will be using them on a day-to-day basis. This probably seems like common sense but we’re guessing you have worked at least one place where all information and new initiatives came from above, and much of it seemingly came out of nowhere because you weren’t likely involved. In these situations it’s very hard to get buy-in from the employees — yet they are the ones doing the work, implementing the rules. So we need to think about their involvement from the beginning. Having users make the rules confers several advantages. First, they are closest to the facts on the ground and best positioned to codify experience into usable rules. Because they will make decisions based on the rules, they can strike the right balance between guidance and discretion, avoiding rules that are overly vague or restrictive. User can also phrase the rules in language that resonates for them, rather than relying on business jargon. By actively participating in the process, users are more likely to buy into the final rules and therefore apply them in practice. Firsthand knowledge also makes it easier to explain the rules, and their underlying rationale, to colleagues who did not participate in the process. It’s important to note here that this is a process, a process in which you are never done – there is no real finish line. You must always plan to learn and to iterate as you learn — keep changing the plan as new information comes in. Rigidity to a plan is not a virtue; learning and adapting are virtues. There’s nothing wrong with strategy. In fact, without a strategy, it’s hard to figure out what to do; some strategy or another must guide your actions as an organization. But it’s simply not enough: Detailed execution, at the employee level, is what gets things done. That’s what the Simple Rules are all about. Strategy, in our view, lives in the simple rules that guide an organization’s most important activities. They allow employees to make on-the-spot decisions and seize unexpected opportunities without losing sight of the big picture. The process you use to develop simple rules matters as much as the rules themselves. Involving a broad cross-section of employees, for example, injects more points of view into the discussion, produces a shared understanding of what matters for value creation, and increases buy-in to the simple rules. Investing the time up front to clarify what will move the needles dramatically increases the odds that simple rules will be applied where they can have the greatest impact. Still Interested? Read the book, or check out our other post where we cover the details of creating your simple rules.